As a collaboration between the Writing and Communication Program and the Ferst Center for the Arts, Student View is, to our knowledge, the first exhibition of its kind in the country, displaying student works produced in composition and English studies classrooms in a professional art gallery that’s open to the public. The exhibition features a wide variety of artifacts displayed in five categories: Collage, Mosaic, Digital Media, Poster Art, and Film. After months of preparation, the Ferst Center Gallery Committee (Doris Bremm, Christine Hoffmann, Jennifer Holley, Julia Munro, Jennifer Orth-Veillon, and Jennifer Parrott, working with Jenna Farmer, Marketing Specialist at the Ferst Center for the Arts) is thrilled to see the artifacts mounted on the walls of the Ferst Center Galleries and to watch the student films on the big screen in the Ferst Center Theater. The best part? Seeing students, faculty, and parents discuss the individual pieces during the reception. The exhibition showcases some of our students’ best work, so don’t miss out on the chance to take your classes to the Ferst Center to see the exhibition before it closes next week. Your last chance to take your classes will be Tuesday, January 31st. As Rachel Dean-Ruzicka describes in her TECHStyle article “WOVEN Field Trip,” the short walk from Skiles is worth the effort. Seeing the work of their peers outside the classroom in a gallery context inspires our students to reach higher and to attempt projects that they may not think possible in an English 1101 or 1102 class or an LCC class. A field trip to Student View makes for a great opportunity to see successful examples of WOVEN communication and may motivate students to work hard, not just for a good grade in your class but also to try to get work accepted for next year’s exhibition. As instructors in LCC, you should also start to think about designing assignments that will lend themselves well for nomination for next year’s exhibition. We will start accepting nominations in early Fall 2012. 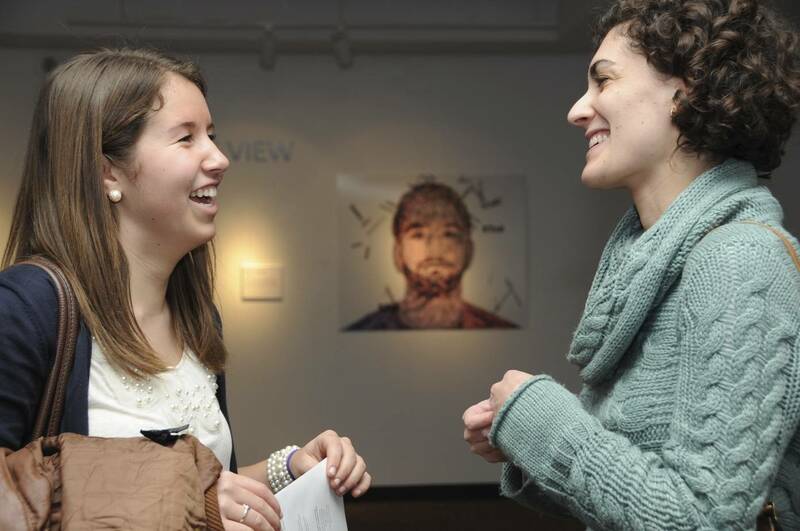 What’s been the reaction to the Student View exhibition? Because of the successful reception and screening last week, the exhibition will move to the Woodruff Arts Center for Georgia Tech Student Night on Thursday, February 16th! This event will give you and your students another chance to see the interesting—even provocative—pieces last year’s students produced in our classes, so make sure to announce this event! 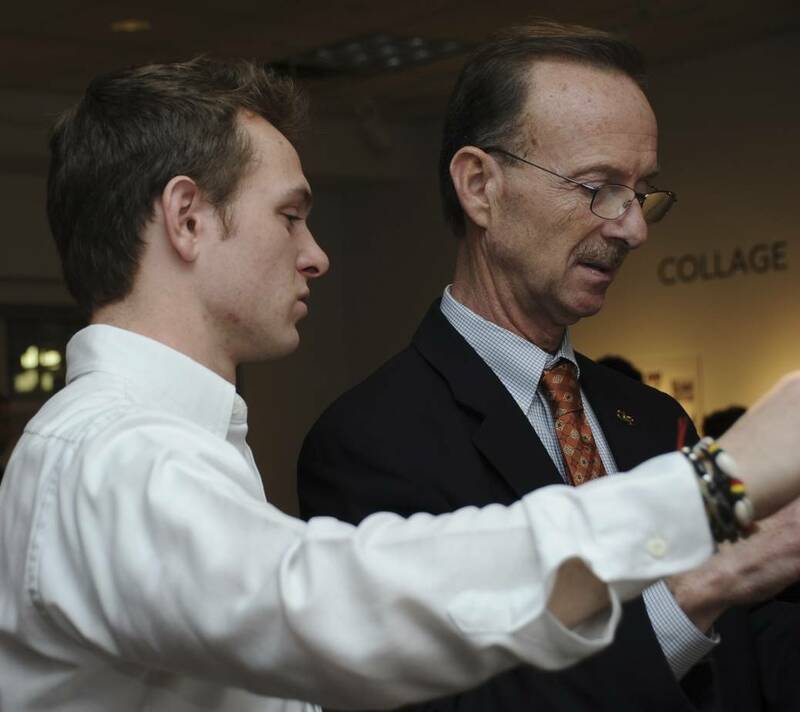 A visit to the Woodruff exhibition may also be a good opportunity to offer extra-credit or to design a mini-assignmentt, so be sure take advantage of this unique opportunity to view our students’ work at Atlanta’s premier arts venue! Doris Bremm received her Ph.D. in Twentieth-Century Studies from the University of Florida. In her research, she specializes in contemporary literature, intersections between literature and the visual arts, literary theory, and film. Tagged Arts Initiatives, Brittain Fellows, current events, exhibition, media, pedagogy, student work.